Seeking to expose dance students to a taste of the professional dance world, CFA’s Dance Program brings professional choreographers to campus for two week-long workshops each year. Occurring in the sixth week of each semester, this program is funded by a private donor and have proven to be an incredible opportunity for the young students to have a “real world” experience as part of their studies. In the Fall, the workshop is presented as a master class series, where the guest instructors focus more on technique and introducing the students to a variety of styles. In the Spring, the workshop is set up as a choreography series. In eight separate classes, a professional choreographer comes in and sets a 90-second routine for the students. The groups then have three hours over two class meetings to perfect the piece under the tutelage of the choreographer. At the end of the week, a showcase is produced, called “battalion,” where students perform these works in front of an audience. The Dance Program initially created the workshop series to ensure a diversity of experience for young students. According to Workshop Coordinator and Adjunct Professor of Dance Jason Myhre, “It is great practice for our students to learn a routine in a short amount of time and to have an expectation of being performance-ready. This happens all the time in the professional world, and our goal in the Dance Program is to prepare each student for their careers once they leave school.” The focus of the week was on jazz and modern dance instruction, and over 100 students, alumni, faculty, and invited guests participated. 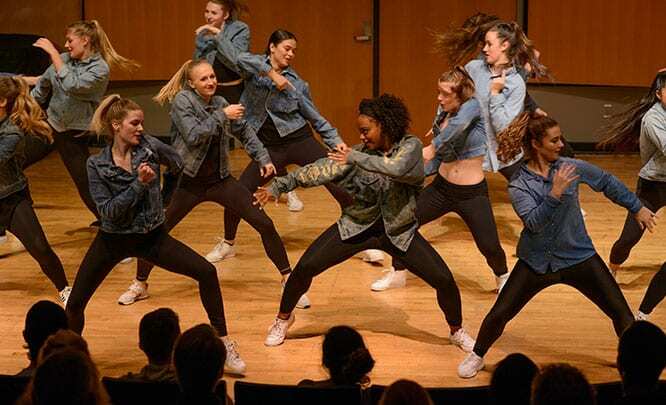 LMU’s Hip Hop Dance Crews iB Modern and Kuumba Beatz performed, as well as a new dance company HEXAGON Dance Collective, which consists of six current and past LMU Dance majors. With the campus’s close proximity to Hollywood and the many industry connections of the working faculty, CFA’s Dance Program can provide its students with access to mentorship from some of the top professionals working in the industry. Guest artists who participated in February’s Spring workshop included Tyce Diorio, Jerry Evans, Leo Moctezuma, Sheryl Murakami, Sabrina Phillip, Helene Phillips, Kevin and Marcel Wilson, and Tovaris Wilson.